Chicken Chili + Oatmeal Chocolate Chip/Raisin Cookies! Put beans in medium pan and cover with water. Bring to a boil; reduce heat and allow to simmer 20 minutes. Discard water. Cut chicken into 1-inch pieces and brown if desired. 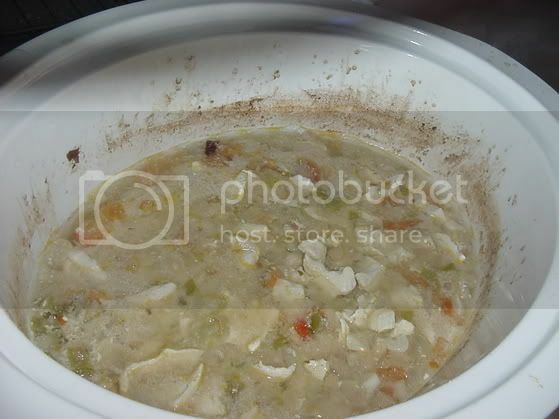 Put all ingredients in crock-pot. Stir to mix thoroughly. Cover. *This was my first attempt at chicken chili and it was delicious. As usual with chili, you can throw stuff in/change ingredients (I added some red pepper, other veggies). Main thing is to NOT put tomato based stuff in...as the taste is different! Also, if you want more heat, add hotter peppers (habaneros)....I didn't have cayenne pepper either. I added chili pepper/crushed red pepper/cumin for flavoring. Highly recommend the crockpot too...makes everything so tender! Preheat oven to 350°F. Line 2 baking sheets with foil; butter foil (I just greased cookie sheets). Blend first 6 ingredients in medium bowl. Mix apple sauce and both sugars in large bowl until fluffy. Beat in honey, eggs, and vanilla. Gradually beat in flour mixture. Stir in oats and chocolate chips. Drop batter by tablespoonfuls onto prepared sheets, spacing mounds 2 inches apart. Flatten cookies slightly. **Keep in a safe container far far away from any cookie monster (you have no idea how serious I am!). *I bake closer to 12-14 minutes. It depends on your oven of course. At 10 minutes, my cookies tend to be a lot more squishy. Last night they came out just right....crispy but still that smooth cookie taste:-) I think my taste testers can agree;-) I mixed semi-sweet choc chips and raisins this time....talk about an explosion of taste! 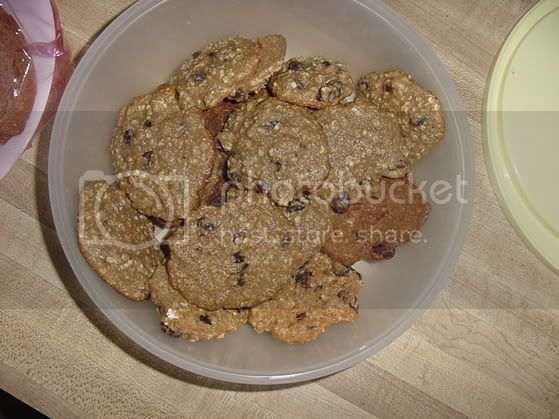 Yum...love the oatmeal raisin and chocolate chip cookies!